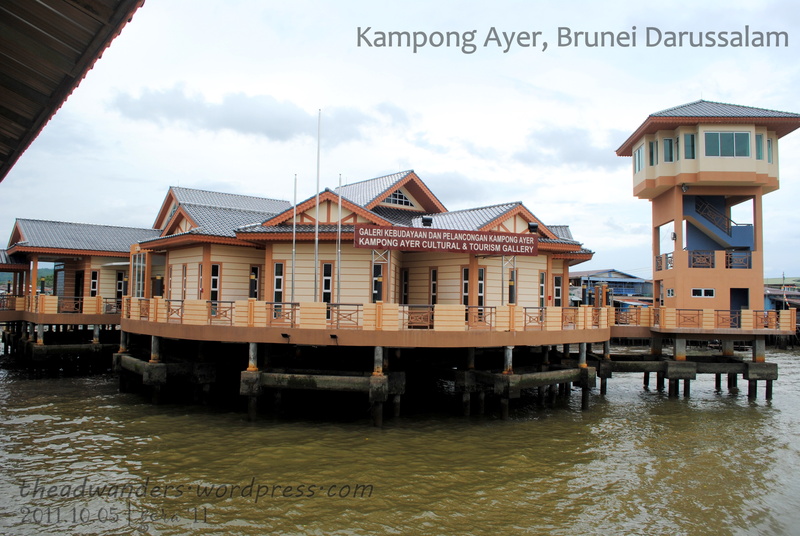 Note: The delayed Part 2 is on Yayasan and surrounding areas, Part 4 is inside the Kampong Ayer Cultural and Tourism Gallery, Part 5 will be the Royal regalia Museum and the Masjid Jame’ Asri Sultan Hassanal Bolkiah. Please bear with my slow writing and uploads! After having breakfast and doing some walkabout and shopping at Yayasan (it’s raining so I had to stay indoors), I decided to go around the complex (actually get lost is a better term) and its nearby landmarks. 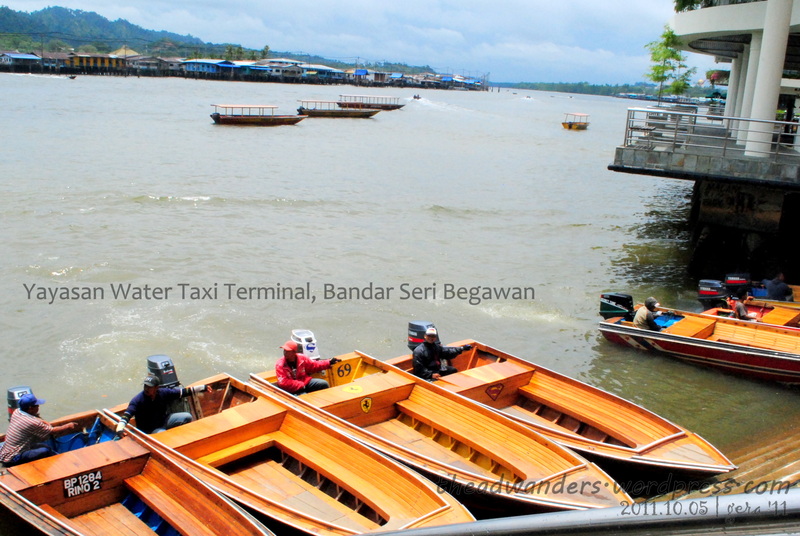 After which, I noticed that a lot of time has already passed and so I really need to go to Kampong Ayer or else miss my chance of seeing the water villages. Since the boat was really fast, the ride was also quite short. 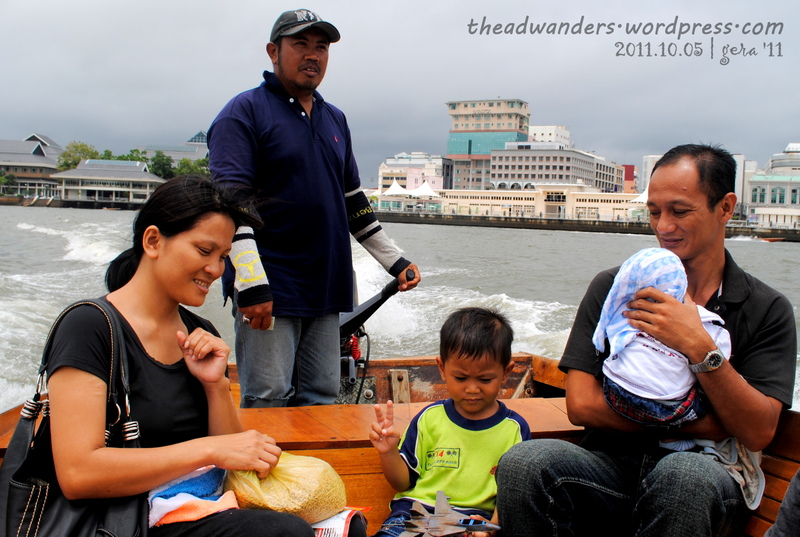 Even so, I was able to take pictures of this family I shared the boat with. Yes, I asked permission first and Ate aka the mom even coached her son to pose for me. After some shots, I returned to a burst mode of snapping since the water villages are really fast approaching. When it was time to alight and pay already, I was fumbling for my coin purse when Ate said she already paid for it. So nice, noh?! I thanked her, she smiled back, and they went on their way, sure-footed. So unlike me. 😦 Anyawy, since I didn’t know what to do exactly in the village, I followed the Yayasan Ates’ advice to go and visit the Gallery. It’s a big structure and I think it’s really hard to miss, especially since its visible already once you leave from the mainland–unless of course you’re heading in a totally different direction. 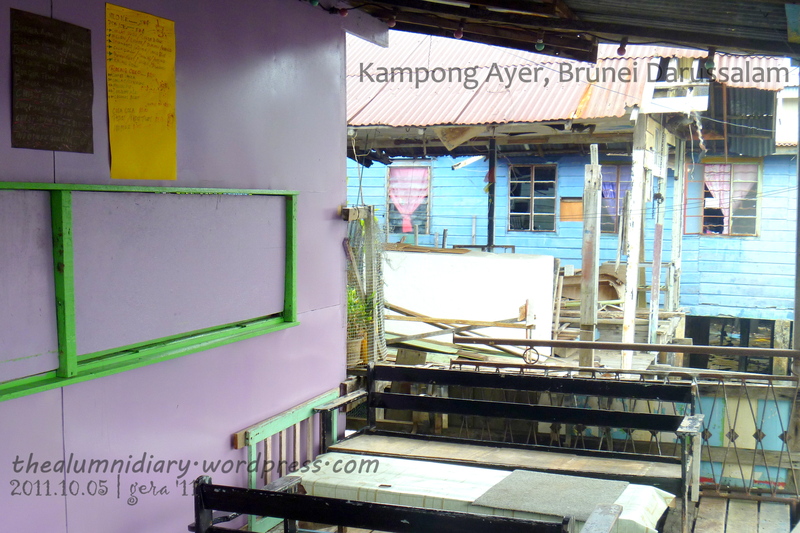 If my human compass is reliable, the Kampong Ayer Cultural and Tourism Gallery is on the leftmost side of the village complex. My first stop was in the second or third “alley way”. I didn’t really plan on stopping but you know, here in the Philippines especially in the rural area where I grew up, it is customary to “ask permission” to the owner of the house whenever they are outside and you are passing by your area. So, as I passed a house, I greeted a middle-aged man with “Selamat pagi!” and my courteous smile. He must have sensed that something’s off with my accent or something coz he immediately asked where I came from, in English (and he was quite good). When I said Philippines, he started telling me stories about his experiences before. I think he has visited Cebu. We chatted for about 10 more minutes, me on the walkway and him in their veranda. If it happened in my town, I already would’ve been forced to sit down with him in the veranda or he would’ve been standing just for me to take the seat. Well, I think that’s just a cultural difference of some sort. And it wasn’t true all throughout the walking exploration. More than just hanging out–it’s a Cafe! After the man’s house, I proceeded walking and in about 100meters, I passed by two old women doing something with some leaves. Again, I greeted them with my “Selamat pagi!” but this time, with a curious smile. They reminded me of my grandmother who already passed away. They greeted me with a reply which is not “Selamat pagi!” but I think something that says “To you too!” or something. And, they did so with a warm smile. So, I decided to stay and chat with them. I was really curious about the leaves that one of the ladies was focusing at. Because, whatever it is, I’m sure it’s the reason why their hands are colored orange. Like, achuete orange. I tried asking the women about it but unfortunately, they speak very little English. I had to rely on my charades and pinoy henyo skills to communicate with them. Man, it was so hard! But, it was fun as well. 🙂 If my understanding was correct, they are sisters. The woman who stopped working on the leaves is the older one, 70 years old and the younger one, 60, is her sister. The younger sister lives in the opposite house (as she motioned so). She’s already a widow. Their house also looked like the typical Filipino home (no, I still was just outside, good thing that there were benches in the place). In the sense that they also hang framed photos and school certificates, complete with medals from classes of course! I actually really wanted to take their photo but when I motioned for the camera and acted like I was gonna take their photo, saying “Picture, can? Can?”, they just laughed and said “No”, waving their hands. I also took that as my cue to continue with my exploration. So, I said my well-practiced “Terima kasih!” and continued my tour. After covering some ground, or water, I stopped for a bit to catch my breath. Not that I was tired but more like I was mentally exhausted, trying to fight the nagging nervous feeling. Until I saw a school boy, all dressed up. Kinilig ako like a gradeschooler stalking that cute classmate. I’ve never seen a young schooler looking so dashing. I mean, he probably studies in a public school, which is like great. It was just sad for me that not all young Filipino boys and girls can dress up like this when going to school. Anyway, it was already about past 1pm and I’m supposed to meet Zaza in an hour’s time. Plus, it was starting to rain again and since I didn’t have umbrella (I left my umbrella in the Philippines coz I had no check-in luggage allowance), I decided to find my way back. I know I look really bad/uneasy/complicated. I didn’t realize that the difficulty I was experiencing inside was really showing in my place! Dyahe! Hahaha. Oh well. 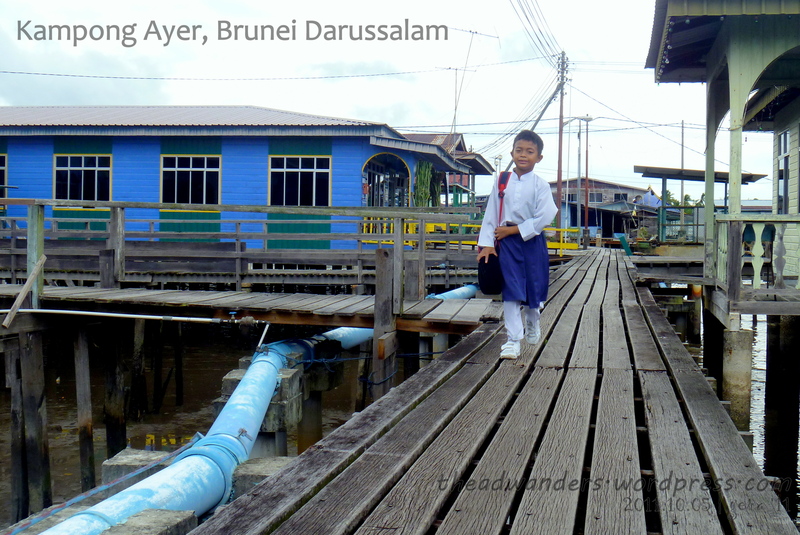 I hope the tour and actual footage would help further encourage you to actually get inside the community of water villages and get to know the people who make the Kampong Ayer into the network that it is now. No. Don’t be shy. Practice your social skills. Who knows, you might meet some of the best strangers you never thought you’d see in a lifetime! 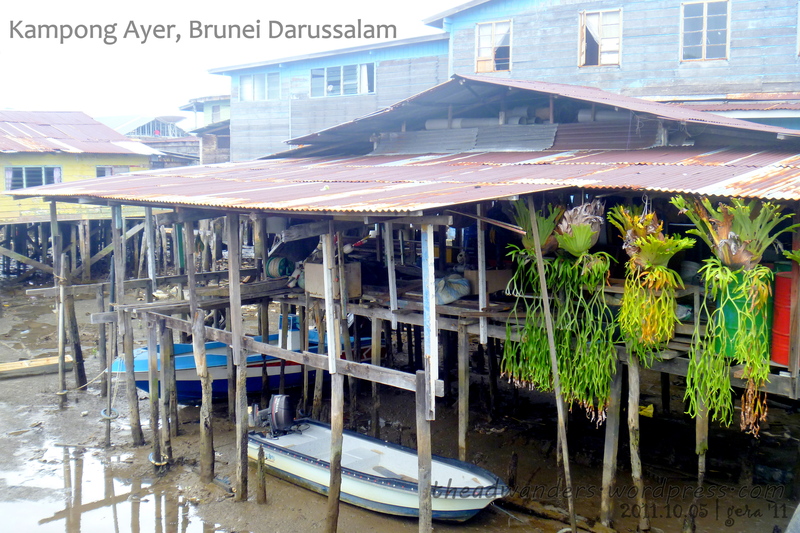 So, again, don’t spend your entire Kampong Ayer tour in the water. Go to the village too! And, I hope you’d get to experience something like mine and more. Happy wandering! We spent more time in the nearby jungle than in the water village (cause proboscis monkey’s one of my fave creature in the world! ), but we’re still blown away by the way of life of these people. It’s quite hard to fathom how they prefer to be on water than on land. Pretty amazing. Talaga? Parang nanghinayang tuloy ako that I didn’t go! I just saw an image of it as a stuff toy in Yayasan! Pero hindi ko din naman ipagpalit ang experience of sharing the morning talking with the water villagers. I can’t point my finger at it but I feel like I learned or discovered something new about the world and myself after I had my conversations with them! 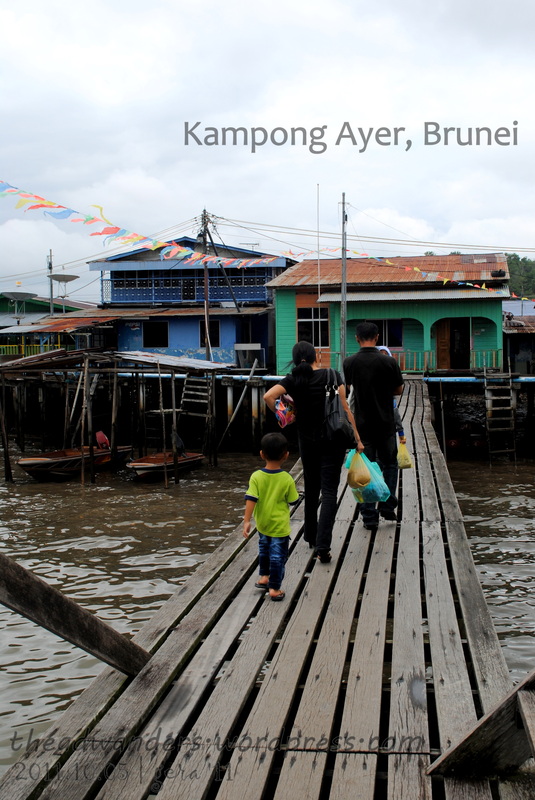 A chance to interact with the locals at Kampong Ayer sounds like a lot of fun, can’t wait to get to Brunei! Hi Arman! 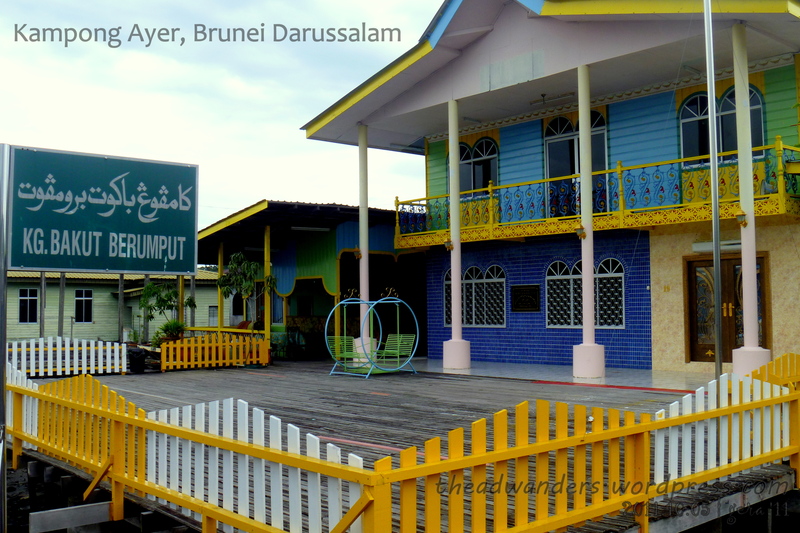 Have you been to Brunei already?! I hope you had a lot of fun! And a great cultural experience!